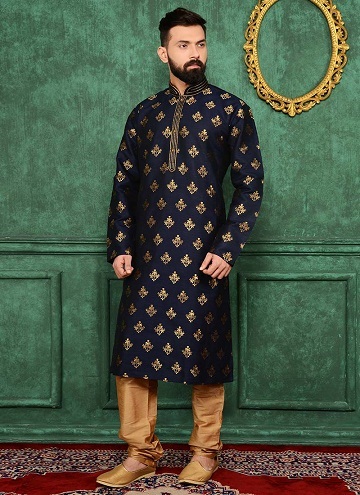 Kurta pajama is not a new fashion style but designer kurta pajama for men is the latest trend for Indian men to dress up in ethnic wear and enjoy an engagement/wedding party or any other festive occasion. Both informal and formal designs of kurta, depending on the fabric or embroidery or design are popular for functions, be it a festival or wedding occasion or cocktail party. Let we have to look at the best kurta pajama for mens party wear. This attractive combo includes rich dark purple colour slim fit dupion silk kurta with mandarin collar and long sleeves. 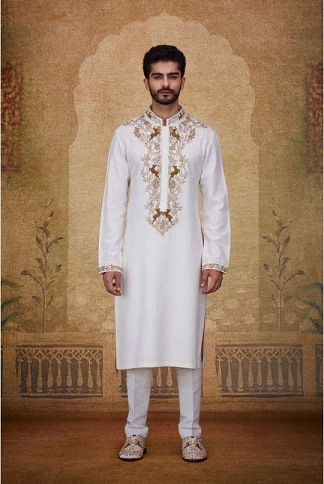 White churidar is tailored from the same fabric in white colour and kurta has the white piping of the on sleeves and collar edges. Look your best in this trendy kurta pajama party wear and make the heads turn. Look your glamorous best in golden coloured silk blend kurta pajama set. Regular fit, long- sleeved kurta and pajama with drawstring closure. 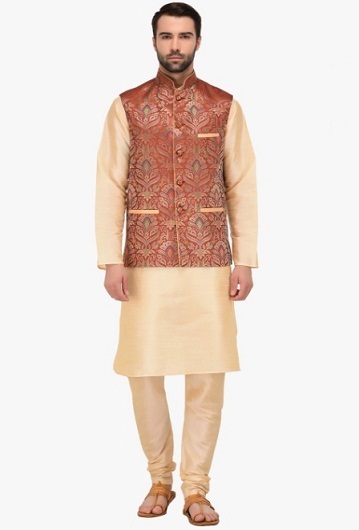 This party wear kurta pajama looks gorgeous when worn with self –patterned multi colour Nehru jacket with Mao collar, potli buttons and besom pockets. It is best suited for all formal as well as festive occasions. This conventional kurta pajama party wear set is the best choice if you want a casual ethnic look. Fabricated from silk cotton blend cloth, the slim fit, long sleeve kurta with mandarin collar and matching churidar pajama is fit to be worn for casual and celebratory occasions. Look your best whatever occasion you are attending and make the heads turn. Cotton and satin party wear kurta pajama with jacket has royal blue cotton satin cowl draped kurta with white churidar of cotton silk blend is complemented with a cream waistcoat. This raw silk jacket has stunning Dori embroidery with front button closure and Chinese collar. This designer set is fit to be worn for weddings and high- end parties. Jacquard weave on navy blue Benarasi silk brocade kurta is designed with silk thread work on front button closure and Mao collar and is complete with side slit pockets. Churidar in matching art silk matching with brocade work has a drawstring closure. 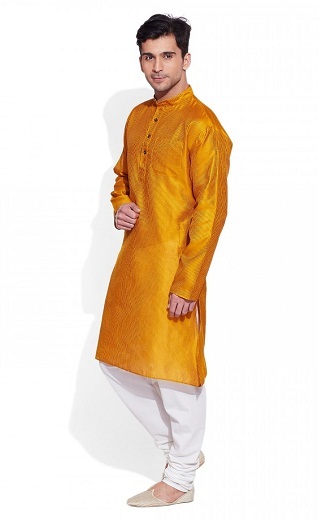 This stunning kurta pajama for wedding party is ideal for Diwali, Eid festivals also. A hand embroidered tussar georgette kurta with gold dubka, aari and zardozi embroidery in vine, floral and deer motifs on the front button closure, cuffs and around the mandarin collar. Matching pajama with drawstring fastening is made of cotton blend fabric. 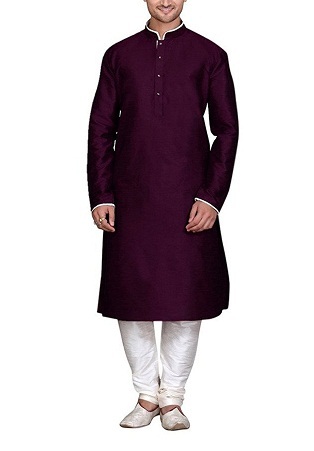 This party wear kurta pajama for mens is perfect for evening parties, engagement/sangeet functions. 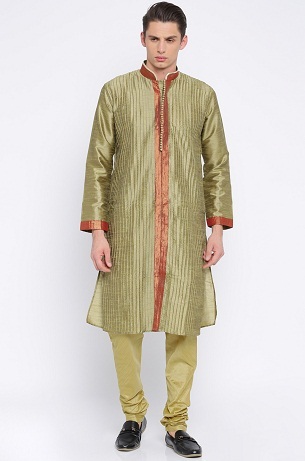 Tailored from art silk fabric, this khaki and gold- toned knee length, straight, regular fit kurta with side slits, long sleeves and Mao collar is edged with lace. This combo is complete with khaki gold coloured churidar pajamas. 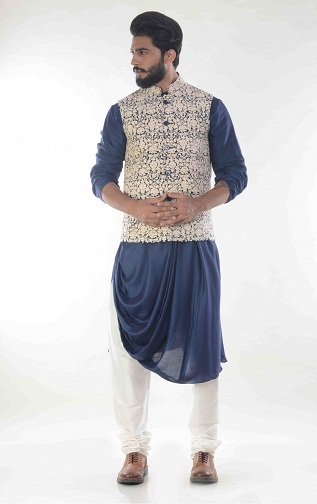 This party wear kurta pajama is perfect for family functions, sangeet/engagement parties. Simple A-line, fine stripped printed men kurta in rich golden yellow is stitched from Dupion art silk. This attractive kurta comes with Chinese collar, front button panel and two sides slit pockets. The pajama is also tailored in white art silk. This kurta pajama for marriage party is perfect for celebratory events, sangeet/ engagement parties. 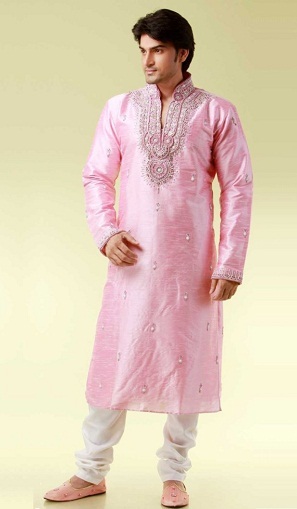 This set constitutes slim fit; knee- length kurta in pink colour and white churidar is made from Dupion silk. This stunning kurta is heavily embroidered around the neck, around mandarin collar as well as the front panel and edges of sleeves. 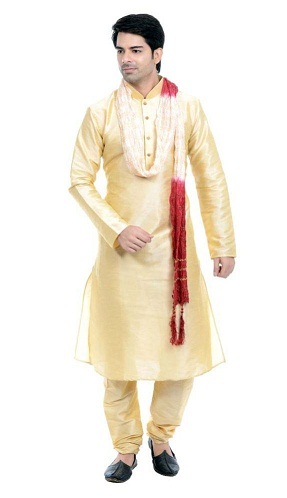 This kurta pajama for wedding party is ideal for creating an impression in wedding parties. 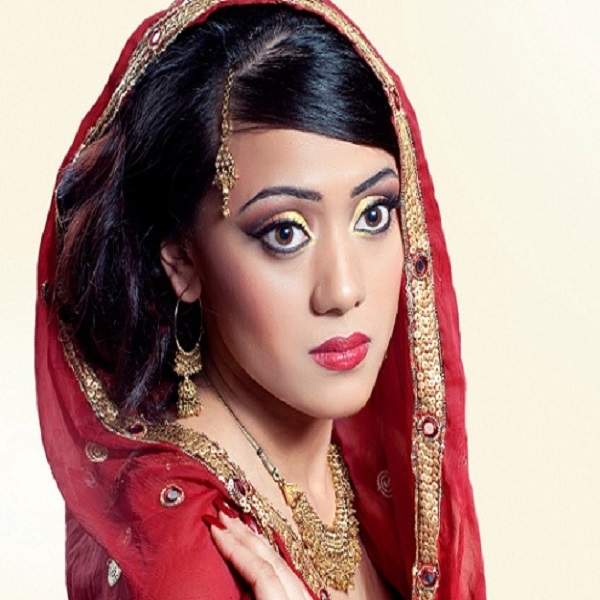 This popular ethnic wear outfit has its origin from Indian subcontinent. Varieties of kurta are tailored from different kinds of fabrics and designers have given a twist in the fashion by paying attention to men’s traditional outfits.